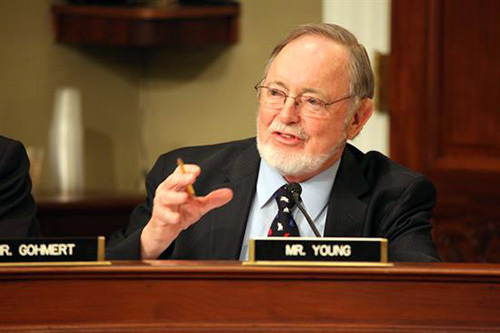 (SitNews) Washington, D.C. - Tuesday, in a House Natural Resources Subcommittee on Federal Lands, Alaskan Congressman Don Young questioned U.S. Forest Service Chief Thomas Tidwell on his agency’s failure to approve new timber sales in Alaska, particularly Southeast Alaska, for the benefit of countless Alaskan communities and the very existence of the timber industry. Congressman Young began his remarks by questioning Chief Tidwell on the President’s Fiscal Year 2016 budget request, which he says only “furthers the agency’s decline in timber management practices to the detriment of the Alaskan and American people.” He continued by prodding Chief Tidwell on the many failures of the U.S. Forest Service in Southeast Alaska. (Click here to watch on YouTube). Congressman Young later pressed Tidwell on the issue of hydro power and what the U.S. Forest Service is doing to streamline the process for countless Alaskan communities that have submitted applications to develop the renewable energy resource. “In the area of hydro, we run into road blocks all the time from the Forest Service,” Young said. “In your budget have you made a proposal to expedite the process to develop hydro so we don’t burn diesel fuel; so our small communities don’t have to fight the battle with your agency, the EPA, and everybody else to try to build real renewable energy? Is there anything in your mindset to work on hydro power?